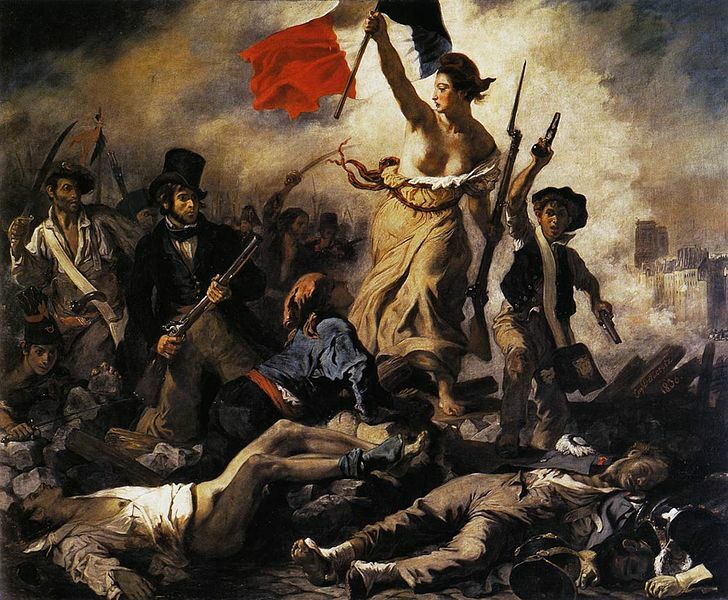 La Liberté guidant le peuple is a seminal piece of art by French Romanticist Eugène Delacroix. Finished in 1830, after the July Revolution, which saw the toppling and exile of monarch King Charles X of France. It has become a symbol of the Republic, and the central figure, Marianne, bearing the tricolor flag and a Phrygian cap, is a timeless figure, the same represented by the Statue of Liberty. Charles X was the last of the senior branch of Bourbon monarchs to sit on the French throne and was a younger brother of the decapitated Louis XVI. The July Revolution kicked off on July 27, 1830, a day after police raided a press office to seize contraband newspapers during a period of heightened tension. Three days of fighting ensued with the end result being a constitutional monarchy. Charles was replaced by Louis Phillipe I, who would himself be forced from power in the Revolution of 1848 (the French love a good revolt). One could spend their entire life thinking that the French Revolution was the end of monarchs in France, but the nation had alternating periods of republic and monarchy until the fall of Napoleon III in 1870. 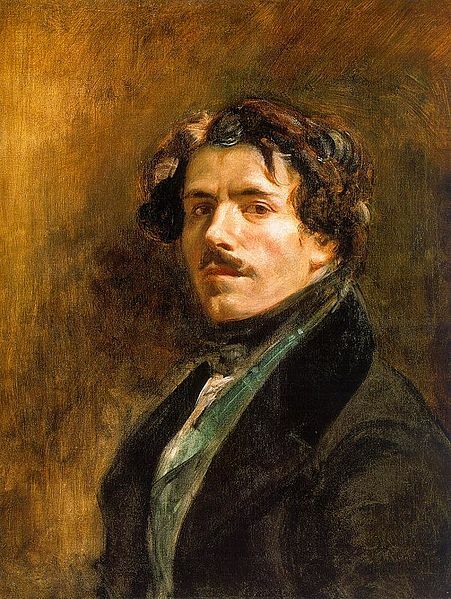 Eugène Delacroix, self-portrait circa 1837. The painting, after completion, was purchased by the French government. The idea was to hang it in the throne room of the Palais du Luxembourg as a reminder to Louise Phillipe to be on his best behavior. It was instead hung in the palace’s gallery for some months before being taken down due to its inflammatory subject matter. It was purportedly hidden away for fear of giving the ever-ready French populace a revolutionary example. It became part of the Louvre’s permanent collection in 1874, where it remains today. The painting is a large one. It measures 2.6m x 3.25m (or 102 inches x 128 inches, for the metrically challenged). The size of the work captivates the audience, especially if you’ve spent time looking at postage stamp-sized pieces like the Mona Lisa. Marianne, the symbol of the republic, takes center stage. The French tricolor flag is also front and center in Marianne’s hand and captures the viewers attention as one of the few sources of color. I’m no art critic, so for a detailed explanation of use of color, symbolism, brushstrokes and the like, click here. Finally I wanted to touch on Marianne’s choice of headgear, the Phrygian cap. From humble origins in Phrygia, in modern day Turkey, the cap has come to symbolize freedom. It’s symbolism goes back to antiquity as both Roman and Greek alike attached ideals to it. During the French Revolution it became the hat of the sans-culottes, or those without silk knee-breeches, the lower classes who made up much of the revolutionary army. The cap was so closely associated with revolutionary fervor that it was banned from being worn until 1870. The Phrygian cap can be seen on the seal of the United States Senate, on the coat of arms of various Western Hemisphere republics and atop the head of your nearest Smurf. This entry was posted in Art, Europe, France, Revolution, Romantic Era and tagged Delacroix, History, July Revolution, Liberty Leading the People, Louvre, Marianne, Phrygian Cap, Romanticism, Statue of Liberty. I’ve heard of the French…I never knew they could be so interesting…well a bit interesting. Wait and see what they do in the 1960’s. Wild stuff!